Our second CHI paper this year is also from the Ardler Inventors project, picking up a little further down the line during the second and third stages of the project. The ultimate aim of the project was to explore how we could use hackathon-like events, which we called Inventor Days, to catalyse a community of people from Ardler in Dundee around using technology to support their local area. This built on our findings from previous fieldwork around hackathons. 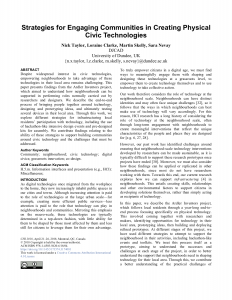 We discussed the Inventor Days themselves in detail at DIS last year, but this paper takes a higher-level, end-to-end look at the different strategies used across the length of the project to support people in creating their own physical technologies for their local area. You can find a pre-print online here and the final paper will be open access from the end of April. We’ve been doing research with neighbourhood-scale technology for nearly 12 years now, working with communities like Wray, Callon & Fishwick and Byker. A key issue that emerged repeatedly through these projects was that, although situated and physical technologies like the Wray Photo Display or Viewpoint were positively received and played useful roles in the local area, these research prototypes often didn’t outlast the project they were associated with. Inventor Days. These hackathon-like events were the backbone of the project, which aimed to bring together residents from Ardler with members of Dundee’s creative and maker communities. Through a series of three events, residents and makers explored the neighbourhood, developed ideas for their local area and prototyped early versions together. One of the most successful approaches at this stage was re-orienting the events around local knowledge rather than technology, casting attendees from Ardler as the experts. Inventor Kits. For the next stage, we took ideas generated through the Inventor Days and created kits that could be assembled and modified by community members. This was intended to explore how ideas from one neighbourhood could be replicated and built upon other communities, and how the provision of simple physical prototyping components could support creativity. Something that worked well at this stage was the perception of the kits as a kind of gift, which respected their earlier efforts while allowing them to create a much more finished version. Community-Led Deployments. Finally, we wanted to understand what challenges participants would face in actually deploying and testing the things they had designed. It was important to both us and the participants that the things that they built actually saw the light of day, even in some temporary form. Alongside the practical difficulties, one of the main things we noticed at this stage was the importance to participants of showing their work to others and gaining feedback in controlled settings, whereas we pushed towards full deployments to test the ideas. The paper has a lot of practical lessons from each of these stages, some of which I’ve touched on above, but I’ll focus here on some of the higher-level emergent themes in the results that will be most useful to people trying to engage communities in this kind of activity. Motivations. Going into the project, our framing was largely about solving problems, but community members never responded particularly strongly to this. While most neighbourhoods have their issues, few immediately lend themselves to the type of technologies we were using. Instead, their motivations were about developing skills, expressing themselves and doing things together as a family. As we found during the deployments, the rewards they gained were similarly centred around personal development. This suggests to us that HCI needs to move beyond exclusively framing neighbourhood-level applications of technology in terms of problem-solving. Ownership and investment. At every stage of the process, we tried to install in a sense of ownership over the prototypes, and it seemed like participants felt real pride in them. But in hindsight, it’s clear that they didn’t have much ownership of the process itself, which was very much driven by us. It’s clear that some degree of bootstrapping is necessary, whether that’s from outside or within the community, but we needed to be more active in ceding increasing control to the community at an earlier stage. Scaling and maintaining enthusiasm. Finally, our goal was to create something sustainable, and while there are some signs of ongoing activity, this proved to be very difficult. The tight-knit group of core participants was a hugely positive experience for us, but it also made it difficult for new people from the neighbourhood to join in later. As well as thinking about how this core group of participants can be supporting in taking ownership and leading the process, we also need to think about ways to make that process more transparent to others in the neighbourhood and support more lightweight types of participation. This entry was posted in Ardler Inventors, Conferences, Project Updates, Publications and tagged Ardler, chi2018 by Nick Taylor. Bookmark the permalink.